Who doesn’t like travelling and that too if it is a culinary tour? 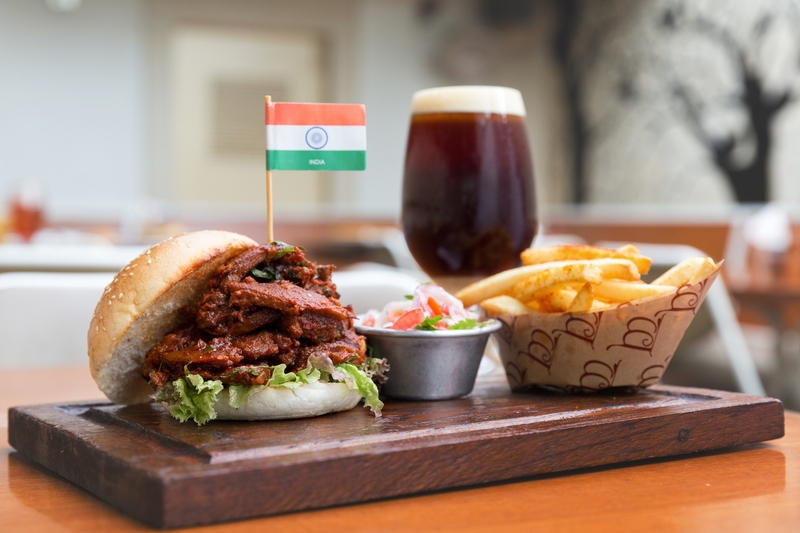 I embarked on world tour to discover the best burgers and beers at Woodside Andheri West, as part of their Around The World in 20 days Beer and Burgers Festival. Of course one has an option to go to their Colaba outlet too. As I bit into I first burger, I could not help lament the fact that though this festival was in its 8th edition, I was stepping in to experience it for the first time. Better late than never I guess! Pioneering the concept of pairing freshly flipped burgers and hand-crafted brews, Woodside this year, has upped its offerings and has introduced burgers and beers from around the world, starting from July 14 to August 2, 2015. The specially curated Burger Menu by Executive Chef. Subhash Shirke was impressive and well-rounded. He was catering to every palate. Burgers from India, France, Spain, Argentina, Italy, Japan, USA. Whew! And in keeping with the latest craze for Craft Beers, they had handpicked artisanal craft beers from Gateway Brewing Company and Independence Brewing Company to enhance the dining experience. Not a beer fan exactly, I decided to steer clear from those. The best ones could not tempt me. Burgers were enough to satiate me. My Argentinian Chimichuri Chicken Burger arrived. Well-presented with french fries in a paper boat, an exciting dip, salad, et al. I settled for a sesame bun. The chicken patty was juicy and moist, unlike several burgers one is used to eating in Mumbai. And had exciting flavours to it too. Well spiced, it needed no dip actually. This robust burger was perfect just by itself. The Peruvian Rock shrimp burger, was my next choice. A generous helping of shrimps for sure, as the shrimps kept falling out of my burger bun. The shrimps were fresh and of a superior quality. Absolutely melt-in-the-mouth. The flavours were a bit reminiscent of a Thai dish, but I was not complaining. Subtle no doubt, but delectable to the core. The dip along with was citrusy and extremely appetizing. Sumptuous and filling, one could not think of tasting any other burger from the exhaustive menu. These were truly world class burgers. The Napoli’ – Italian chicken burger (Italy), Brit sun day roast! (Britain), B’ in a ‘B’ – healthy eating in a bowl (US), Duck Confit Burger (France), Spanish RoastPork Belly Burger (Spain), were the other options and definitely sounded inviting. Meat lovers are going to relish these. Apart from the non-veg selections, there were several unusual Veg ones. 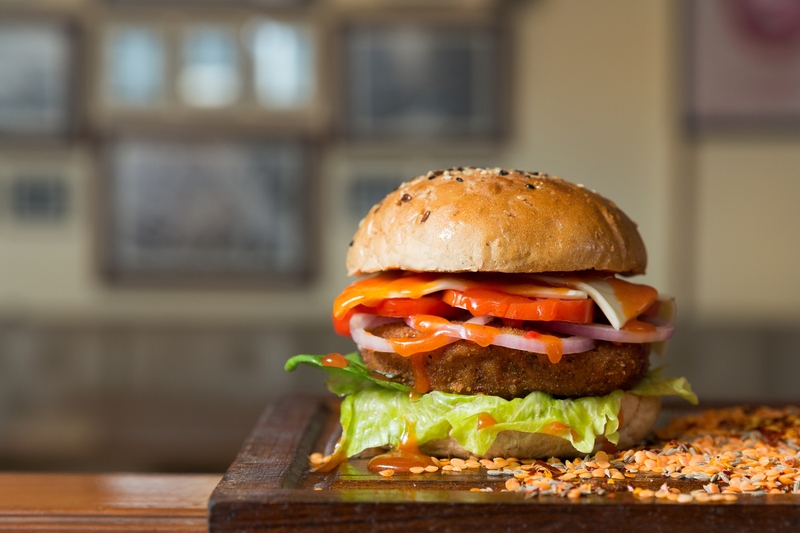 The Thai spiced lentil burger and Japanese Teriyaki Tofu Burger caught my attention. Would love to go back for those. Each burger was aptly paired with a beer. Given the quality and freshness of the ingredients, portion sizes, the burgers were well-priced I thought. The attentive staff and their prompt service, bowled me over. Not obtrusive, just the way I love it. It is always a pleasure to interact with polite and well-informed F&B staff and Cyril, was all that and more. 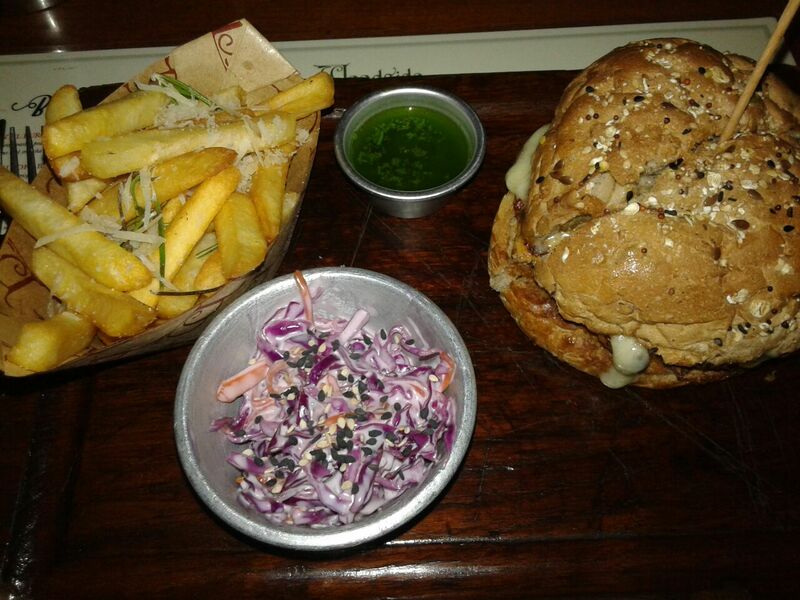 I returned home, with my taste-buds tingling in excitement, my tummy happy with the delicious burgers I had sampled. Good to have been to Woodside I thought! Goan food is always a great temptation. What with the myriad flavours and array of dishes to choose from? 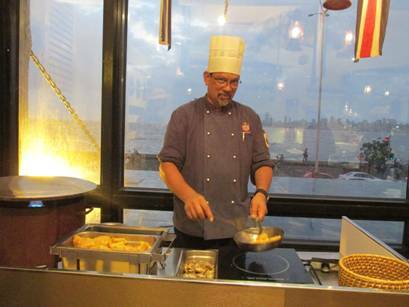 Chef Vasco Silveira’s Goan Food festival at Bayview Restaurant in Hotel Marine Plaza took me by surprise. 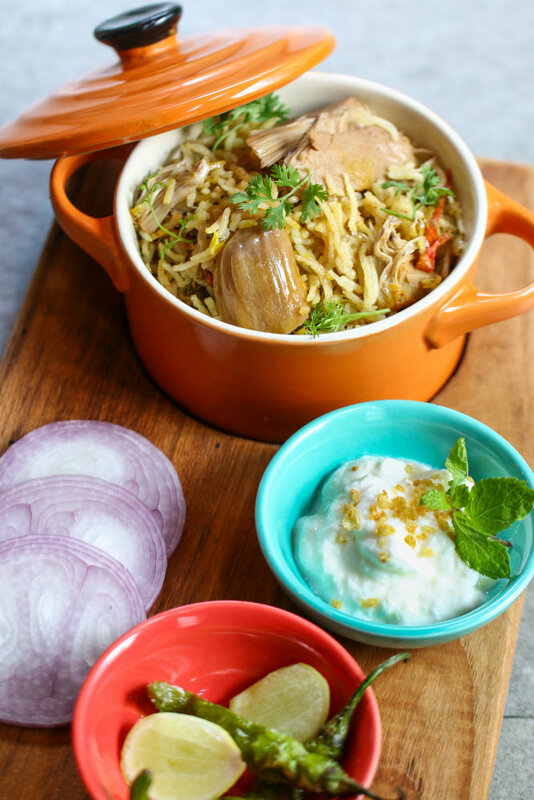 The food was traditionally Goan, but with a twist, that’s because of the chef’s Portuguese- Angola influence. With five menus that rotate over the 10 day festival starting July 10, you will definitely not sample the same thing twice unless you make a conscious effort to do so.The usual spread consists of soups, starters, mains and desserts with ample vegetarian and non-vegetarian options. Over a chat with Chef Vasco, we tried the chicken soup. The soup was a mildly tempered broth with pieces of chicken, veggies and noodles tossed in. It was flavourful, but not exceptional. Did not tantalize my taste buds enough. For starters we had spiced pan fried chicken, squids with pesto sauce, stuffed mushrooms and veg-croquettes. The batter coated deep-fried Mushrooms stuffed with herbs and cheese and the chicken starters were delicious. In fact the mushrooms got my vote instantly. Melt in the mouth, these were a class apart. The squids tossed in garlic butter and served on Pesto sauce, too were palate pleasing. The chicken had an interesting marinade. The main course was laden with Fish—. Prawn Vindaloo, Lamb Stew and Chicken Curry. Rajma Xacuti, Mushroom Chilli fry, Channa Pulao, Potato Loaded! And these were just a few of the sumptuous buffet spread. Of the main course, The Lamb Stew and the Fish Escabech stood apart. The lamb was tender and succulent. We were told the lamb is cooked in red wine. Certainly aromatic. The stew with generous amounts of potatoes, was light and comforting. Enjoyed it thoroughly. 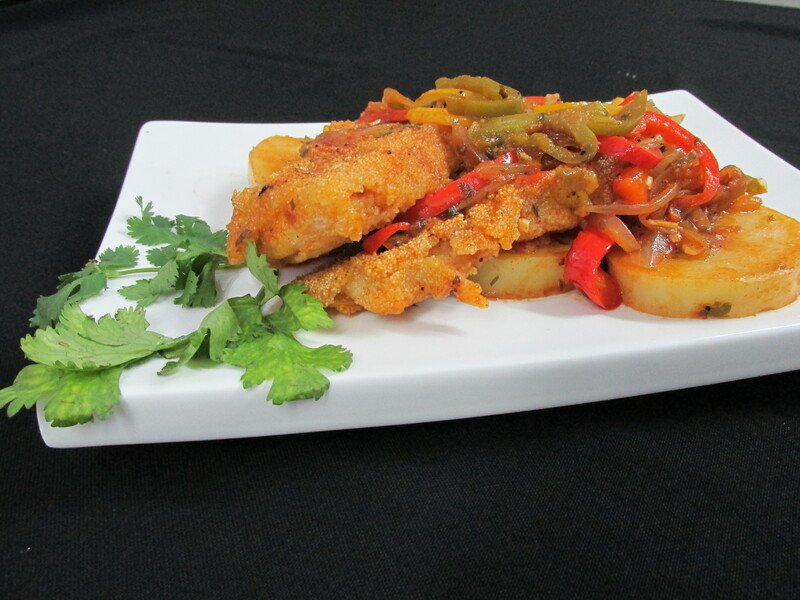 The fish, placed on a bed of caramelised onions and juliennes of bell pepper, was lightly tossed in some Goan herbs. The Potato Loaded, was true to its name. King sized potatoes were halved and the centre scooped to from a large cup which was loaded with veggies in white sauce. 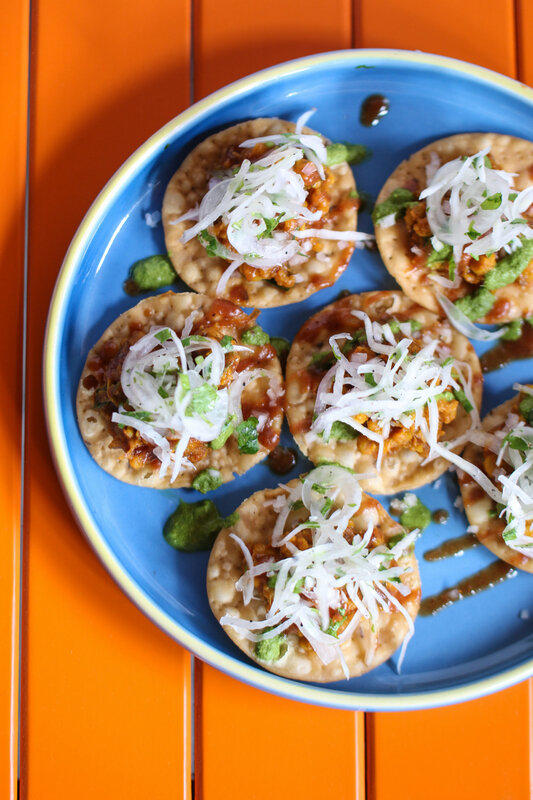 These dishes were more continental than, Goan, actually. The Vindaloo was a coarsely ground paste of Chillies. It was rustic and fiery. The chilli overpowered all the other spices and the vinegar. The Chicken curry was pleasant, as was the Mushroom Chilli Fry and Rajma Xacuti. For desserts there was the traditional Bebinca, a layered pudding and the Bolo Sans Rival (A cake without rival) a layered cake of French origin. The chef informed us that traditionally Almonds were used, but he chose Cashew as they are not only sweet but also easily available in Goa. Both the desserts were perfect in their texture and sweet content. I could live on those 365 days with guilty pleasure. Overall, Chef Vasco’s spread was elaborate and quite interesting. Given his vast experience of running a restaurant in Goa, he is obviously adept at his culinary creations. 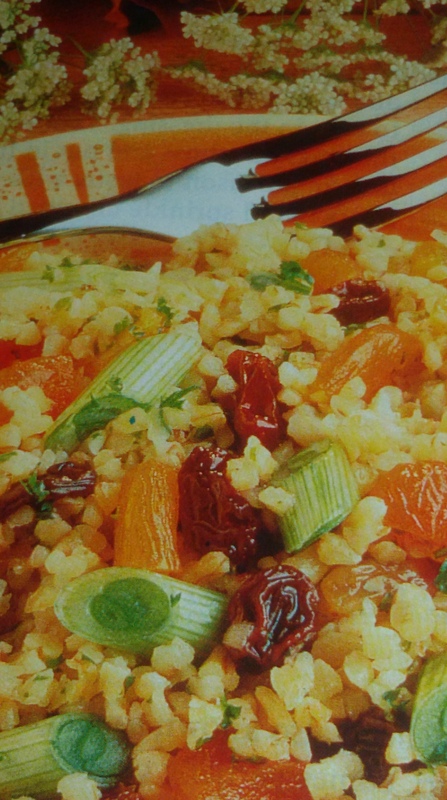 With most of his dishes being under-spiced and with somewhat less salt it seemed that he caters largely to the uninitiated Goans and Europeans, as the traditional dishes lacked the authenticity and the punch of the land. Perhaps intentionally. And most of all, the traditional Goan Fish Curry and the rustic brown rice was definitely missing from the menu. It was like searching for the Goan in Goa! But nevertheless, it was a pleasant experience with Konkani music et al, which I would willingly repeat, if only for chef’s innovative streak. Viva Goa! Taste buds are tantalized often and palates are pleased at many meals, but it is not everyday that you sample food that touches your soul. Curries of the World at Shamiana, Taj Mahal Palace Mumbai, was one such memorable experience. While I have had the privilege of travelling a fair bit and experiencing several global cuisines, I have never tasted such an amazing array of delectable curries from across the world as created by Chef Amit Chowdhury and his team. Shamiana had curated a special menu bringing together the innovative curries made using a complex combination of spices and herbs across the globe – Cape Town, Spain, Africa, Portuguese, Brazil The menu looked so inviting and the stories, behind each curry, interesting, that I read with rapt attention. Our Pollo al curry, aka Spanish baked Chicken curry, Catalonia bread and Valencia style Mushroom and Beans arrived. I was floored with the presentation. Suddenly felt like royalty. The curry was light, with subtle flavours and extremely comforting. It soothed our palates. The beans and mushrooms accompaniment, added the right amount of crunch to the dish and perked our taste buds. Visually of course, it was poetry on plate, oops platter actually! We had just about soaked these flavours that our next, Guyanese crab curry was served. What can I say about this magnum opus of a dish? 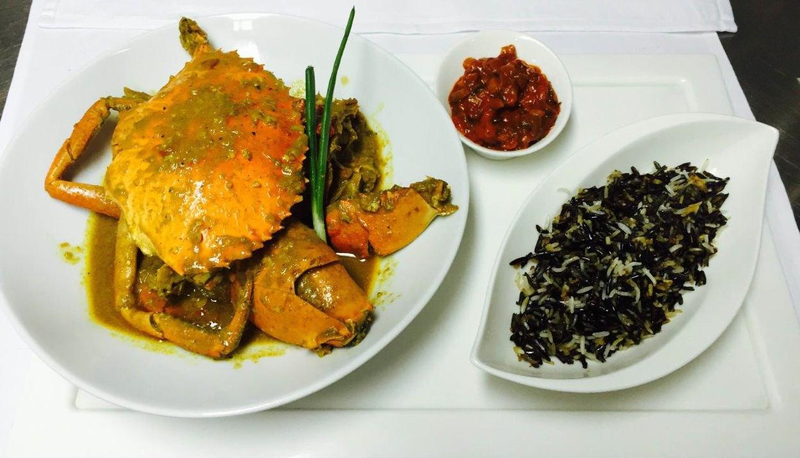 The Arabian Sea Crab curry, with Wild Rice and Hot peppers Relish was a treat for the eyes and undoubtedly for the palate. While our coastal crab curries in India are so heavily spiced (but delicious) this one was so fragrant and light. Delicately flavoured. The wild rice, was the highlight and I enjoyed it thoroughly. It had a bite to it which other varieties of rice don’t quite offer. The Bunny Chow, our first vegetarian curry, was artistry by the chef. 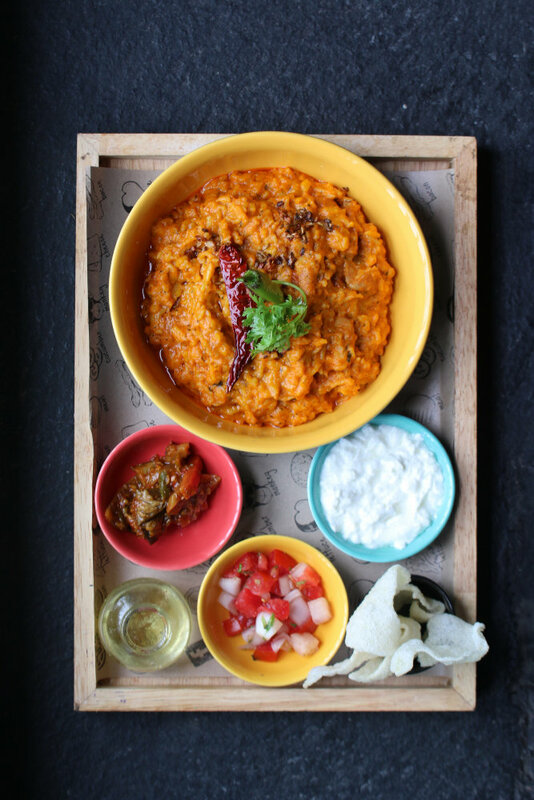 Durban Pumpkin, Baby Potatoes, Cottage cheese and Lima bean Curry served in Crusty bread, which had been scooped beautifully to become a serving dish. I was spellbound. I loved the way the vegetables were combined in a sweet-spicy thick curry and the crunchy bread paired well with it. Reminded me of a Goan curry and pao meal. Our last curry for dinner was the Japanese Mushroom and Tofu Curry – Japanese curry with shitake, cremini and haricot served with short grain rice, crispy onion and pickled vegetables. The flavours in the curry were a bit too sharp and overpowering for my palate. The rice provided some relief, but I would not rate this as one of the best on offer. My vote definitely went to the Guyanese crab curry. Sea food lovers may love the Trini Shrimp Curry – Caribbean shrimp and green pepper curry with apple Kuchela and Jamaican rice, served with fried plantains and salsa. 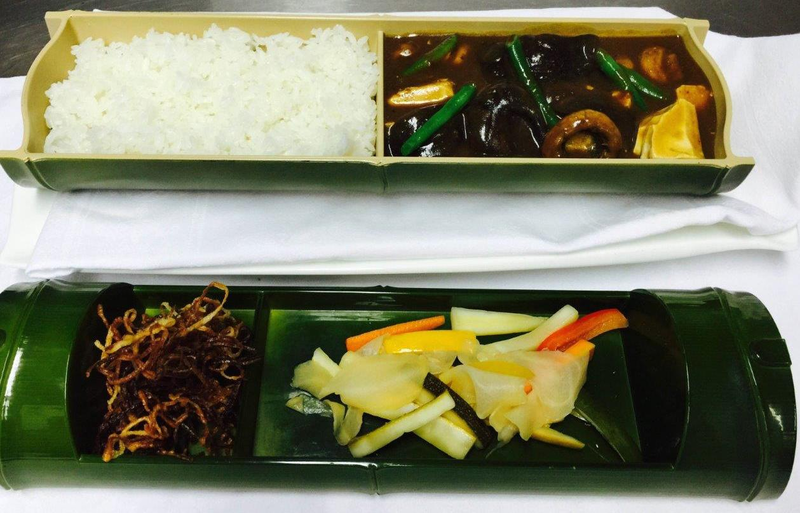 For vegetarians, there was the Ottogi Curry – aubergines water chestnuts, bamboo shoots, glass noodles, garlic sesame kimchi with simmered lotus in soy sauce. I missed having the Khoresht e Gheimeh – Persian lamb and split peas curry, tachin, mint yoghurt, sabzi khordan served with French fries. Chef informed me that this curry makes use of liberal amounts of saffron to give a unique and flavourful taste. Sounded exciting, but I was satiated beyond words and there was no scope to taste even a spoonful. But I had enjoyed every morsel of what I tasted, so had no regrets. Palate pleasing flavours, outstanding presentation, impeccable service and an extremely creativie menu. With these thoughts, I left Shamiana.